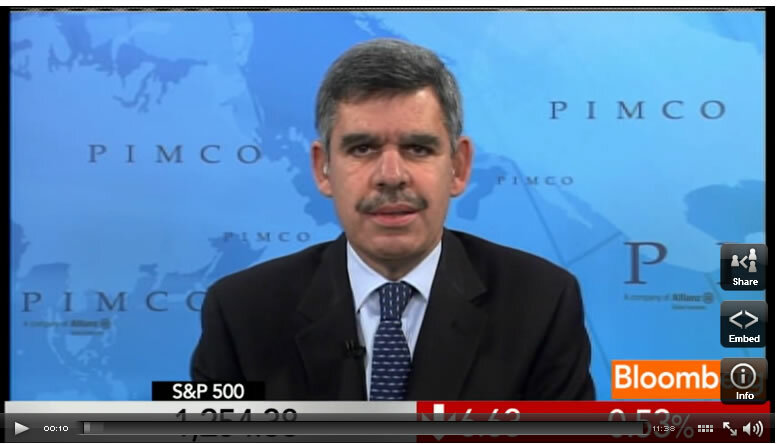 PIMCO CEO and co-CIO Mohamed El-Erian spoke to Bloomberg Television's Betty Liu about Europe's crisis and said that the ECB is waiting for governments and the IMF to "step up" before taking further action. El-Erian also said that PIMCO's investment tone is to "be careful" and that the bond fund is maintaining a "generally defensive and selectively offensive" investment strategy. "Fascinating. He and the ECB have framed this saying that Europe does not just facing a debt crisis, it is now looking at a mild recession and significant downside risk. Markets got excited when they heard ECB was stepping up support of the banking system with nonstandard measures. Futures went up. Then, the markets got disappointed when the ECB did not extend its help to struggling sovereigns, and then the markets got really disappointed when Draghi said I was misinterpreted last week when I mentioned fiscal compact. He did not mean this to be a signal the ECB was going to come all in. It is fascinating to watch the volatility. The ECB like everyone else is waiting for European governments, other European institutions, and the IMF to step up to the plate." "It is hard to tell. It is the right move in terms of maintaining the institutional integrity of the ECB. It is not the right move if you believe this crisis is getting worse and worse, and you need to have the Colin Powell doctrine of overwhelming force. There are judgments being exercised here. Critically, we need to see what happens tomorrow. The stakes have been raised hugely and the approach has changed. It's a very subtle change but an important change. The original approach was to stabilize the periphery. Now, there is a recognition you need to strengthen the core of the eurozone, and that is why president Nicolas Sarkozy talks about things like another foundation for the euro. This is big, and we will look back at this as a big moment in history." "If you want to change the game tomorrow, you need to come up with important and credible decisions. The first decision is a vision of what the eurozone will look like in three years. Will it be the same size or smaller and less than perfect? The second is a clear signal as to who will provide the bridge as the European governments implement all this, i.e. a signal the ECB would be willing to go all in. Third, you need a mix of not just debt and deficit containment, but also growth. We need to see these things come out tomorrow otherwise markets will remain very nervous." "The downside risk to the global economy would increase even more. The ECB talked about it today. People are worried about it. That risk would increase more. If we fall short, the fragility of the banking system in Europe would increase and the costs of the peripherals would increase. There is a lot at stake." "I am not surprised. There are three possible outcomes. One is Europe succeeds in maintaining the current euro zone. Two is a smaller eurozone. Three, and hopefully this will never happen, is the total fragmentation of the euro zone with 17 countries introducing their own currency. That discussion about different scenarios is something that everyone should be having because there is a probability for each of these." "It is not about kicking the can down the road. Europe has been rolling a snowball down the hill. The snow ball gets bigger. The problems are getting bigger and bigger and the dynamics of the snowball gets more difficult to control. Europe has to stop rolling the snowball down the hill." "It's an important step. The banks have three issues. They have had liquidity issues now that they have been shut out of private-sector financing. They have asset quality problems because their own sovereigns under pressure. They have capital adequacy issues. What the ECB is trying to do is to help using liquidity mechanisms. They extended the term of the liquidity financing from 1 year to three years. That is a significant move. Second, they are relaxing the collateral requirements. They will accept more instruments in exchange for cash for the banks. The move on the first issue is liquidity, but the two other issues remain -- capital adequacy and the health of the asset side." "That is a multi-year theme. The banking system will be smaller, less levered, and hopefully will be safer. Both the markets and the regulators are pushing in that direction. Banks today are facing enormous pressure to delever. Some are doing it in an orderly fashion. Others, in Europe in particular are doing in a disorderly fashion. I think the theme is a smaller banking system if you look forward three years." "That question will be debated for years. They operate in different contexts. So, the fed has a lot more freedom and has a twin objective. It has growth in its objective. The ecb has treaties around it, it is more limited and only has one objective, inflation. They are operating in different contexts. The second issue is the fed feels the major risk to the U.S. is recession. The ECB is wired differently. The ECB's DNA is to worry more about inflation. These are different central banks operating on different fields, and all of us have to somehow reconcile all of these actions." "I think it was important that he goes because the Europeans need to be encouraged to be bold. They need to be encouraged to take some steps and finally get ahead of the crisis. They have been chasing this crisis for the last two years. The less good reason is there is an attempt in Washington to divert attention away from our problems to look how difficult Europe is. I would hope that this trip was motivated more by the first issue then a second issue." "We are in the middle of our quarterly strategy meeting where we bring in our portfolio managers from around the world and discuss the outlook. We are in the middle of this, but so far the tone is be careful, this is a time of great uncertainty, markets and policies are changing. So generally defensive and selectively offensive."